Here it is the middle of September and my summer is now at an end. It is back to school/work and being a productive member of society once again. It has been a bit difficult because everyone wants to know if I “had a good summer” and the truth is, our summer was very stressful and filled with health difficulties for both my husband and myself. I took a bit of a break from blogging – both writing and following – because my head was not in a good place. I’ve mentioned in the past that I have lymphocytic colitis and severe IBS. Sometimes these conditions don’t bother me too much and sometimes they make my life miserable. I have been very sick most of the summer, suffering since May with constant bouts of colitis. I went to see our new family physician who prescribed a new medication, then I proceeded to go back to the colon surgeon who was treating me last year, who then referred me to a new gastroenterologist. I am now on a very restricted diet – no wheat, dairy, or high fiber fruits or vegetables -and also a new regimen of OTC meds. Hopefully I am on the way to regaining my life. My husband has also been dealing with his own issues. For the past few years he has been experiencing episodes of memory loss, difficulty concentrating, struggling at work, trouble driving, etc. Our new doctor ordered an MRI and the results showed something called Global Volume Loss and Atrophy. This was a very frightening diagnosis for both of us, as it can sometimes be a precursor to early dementia. It took months to get an appointment with a neurologist who specializes in memory loss and dementia. In the mean time he was evaluated by a psychologist who determined he has all the symptoms of mildly-severe ADHD without it actually being ADHD. While we waited to see the neurologist, we began to get our house in order, having our wills drawn up, getting durable powers of attorney, etc. and discussing options should he become unable to work. Suddenly our future looked very different than it had a short time before. Finally in late August we saw the neurologist who looked at his MRI, did some in-office tests and asked a lot of questions. She declared she didn’t see anything concerning on the MRI and basically said she didn’t know what is wrong with him and sent us on our way, referring him to other specialists for more evaluation. Even though this was “good” news, we left that office in a state of shock and frustration and anger. Instead of celebrating we left there with more questions than answers. One specialist she referred him to is a neuropsychologist and the earliest he can be seen is January! In the meantime, he is still experiencing the same symptoms he’s had all this time. We both feel frustrated and a bit bewildered. Here is a gallery of photos of some of the work. Almost ready for the septic tanks. The bulldozer in our yard and extra gravel. 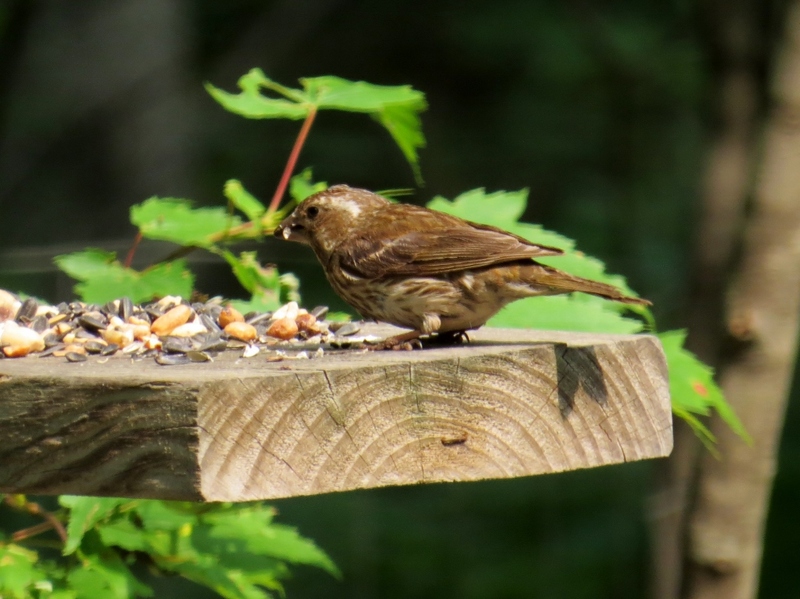 The weekend of August 20th when we were up there we actually had some very good birding opportunities and I added several species to my list including grasshopper sparrows, clay-colored sparrows, and I finally got to see and photograph a brown thrasher! I was so thrilled! Female oriole (?) or scarlet tanager? Juvenile eastern towhee eating berries. The birds were active in our yard, too. 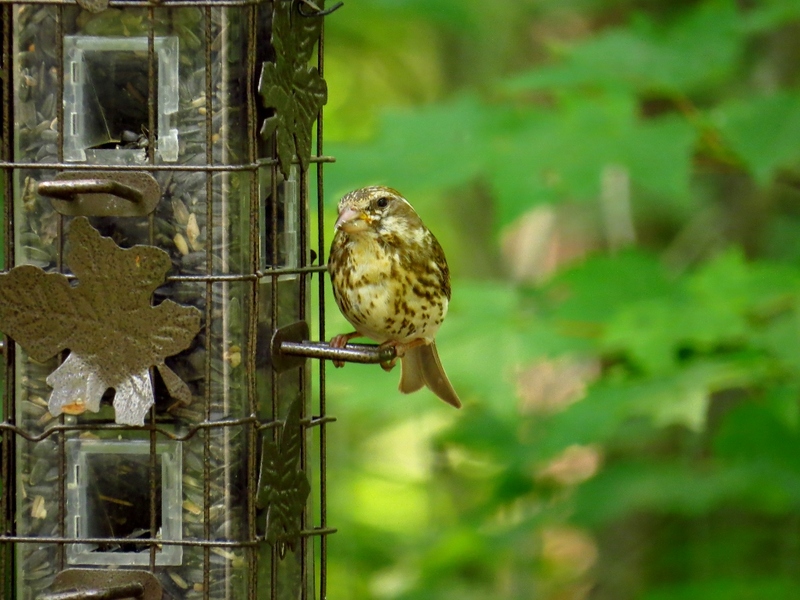 We have had many northern flickers and I got some really good shots of an ovenbird. 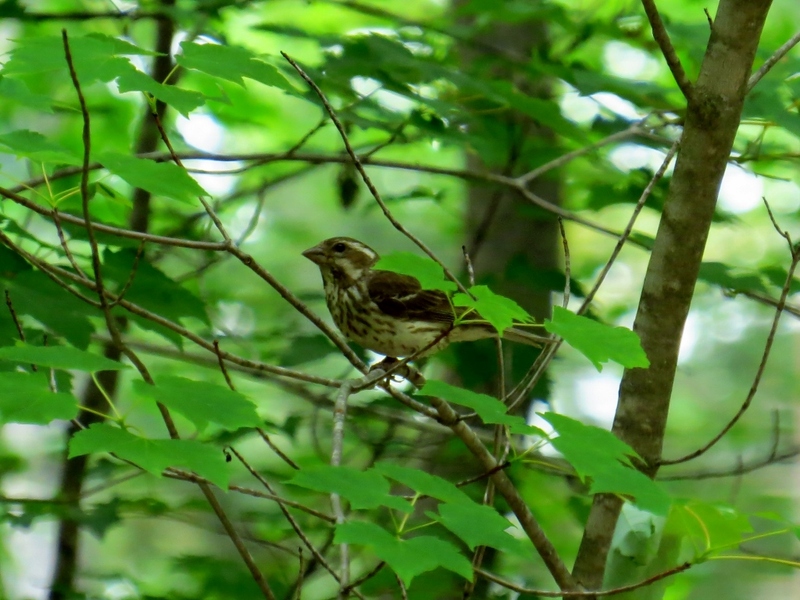 Female grosbeak watching the flickers. Over Labor Day weekend we didn’t do too much because of the high heat and humidity. A couple of days it was all we could do to function! We did go to a lot of garage sales and one night we drove out to Sportsmen Dam Lake in the dark and watched the northern lights. On Labor Day the temperatures fell enough that we could take a nice hike on the High Country Pathway. We drove up to Tomahawk Lake and did a four mile trek. We didn’t see anything of interest, but it was a very pleasant hike and it sure wore the dogs out! 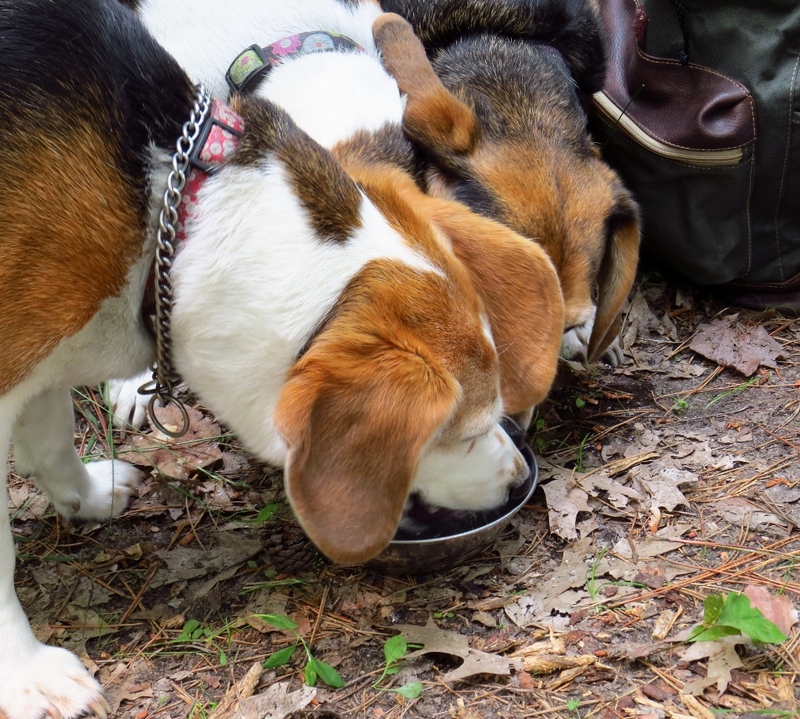 The beagles take a break. Tomahawk Lake on a cloudy day. Milo playing in the lake foam. This past weekend we went on a little local adventure, driving up to Lake Erie Metro Park in Brownstown, Michigan for the broad-winged hawk migration. It was a really awesome experience! I didn’t get any photos of the hawks as the “kettles” they fly in were way too high up, riding the thermals. They were very hard to see with the naked eye. There was a very nice group of hawk counters there, from Hawk Watch, they were very helpful and encouraging. The hawk counters and watchers. 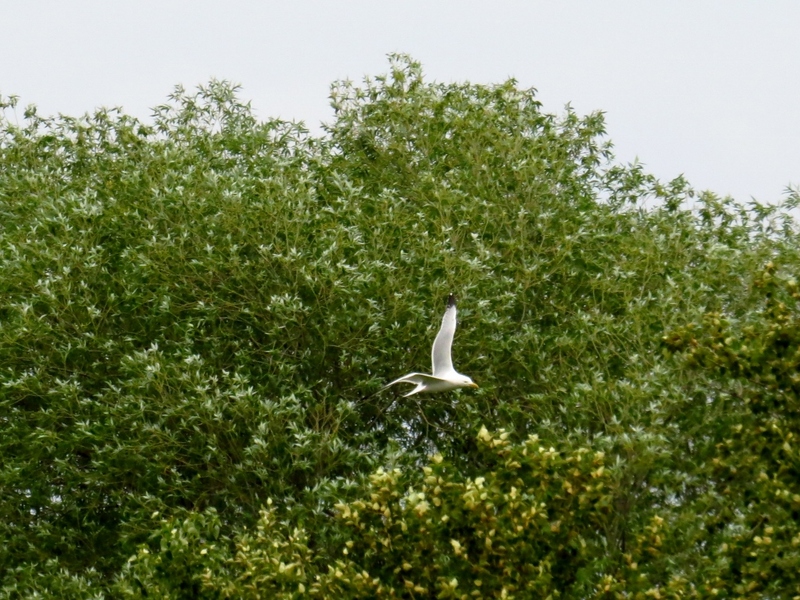 We also walked two different trails while we were there and saw plenty of birds. Along with adding the broad-winged hawk to my list, I was also able to add black and white warblers, pie-billed grebes, Philadelphia vireo, and black polled warbler. As many of you know, I’m Miss Perfectionist about my photos, so I was intensely disappointed by all my shots from the day. Here are two of the best and they are not very good. Philadelphia (?) or red-eyed vireo? I posted a few others on my Facebook page, so you can check them out there if you wish. Despite my frustration, it was a lovely day and we had a great time. We may go back this weekend. Watching the hawks was certainly a thrill! Now that I am back to work, we won’t be free to go up north as often. We hope to go up for Elk Fest the last weekend of this month, but it will be a very quick trip. Then I will be off to Tennessee with my six sisters for our annual Sisters’ Retreat the first weekend of October. I hope to get back to blogging on a regular basis and want to catch up with all my blogging friends. I really have missed you! We spent the past five days at our northwoods hideaway. I didn’t do journal entries because we weren’t doing much that was worth writing about. I plan to do a summation of our stay in the next couple of days. Even though we didn’t have much in the way of exciting adventures, I was able to complete the fourth photo challenge from the book Better Photo Basics by Jim Miotke. The fourth challenge is to Capture Reflections. Evening reflections on Sportsmen Dam Lake. Driftwood and reed reflections on Sportsmen Dam Lake. Dark reflections on Sportsmen Dam Lake. Sunset reflection on Sportsmen Dam Lake. As a bonus, we were also able to enjoy a lovely sunset. If you have any tips to share on capturing reflections, or you just want to give me your two-cents worth on my photos, please leave a comment in the section below. If you would like to see the previous challenges – Flower Macro, Scenic Landscape, and Inspired by Nature – check my archives to the right of the screen. You can also join the challenge on Facebook by clicking the link at the bottom of the page. I love seeing and sharing photos by my friends! This is the second installment in my series on a trip my friend Juli and I recently took to the Toledo Zoo and Aquarium. You can read Part I here. After spending a good amount of time in Africa! Juli and I took the bridge from the north side of the zoo across the Anthony Wayne Trail to the south side. Just a short sidebar here, in the “olden days” the zoo had a tunnel that went beneath the Anthony Wayne Trail from the parking lot to the main entrance to the zoo. But this was deemed impractical due to all the people taking strollers that had to be lugged up and down the steps, plus it was wet and crumbling, so a new bridge was built across the road. I guess I should have taken a photo to give you a better idea of what it’s like now. I have to say, although the bridge is convenient (especially if you are pushing a stroller or pulling a wagon) I do miss that old tunnel. It had a unique atmosphere and mystery about it. Across the bridge, you can choose to go down the steps or taking the spiral ramp. 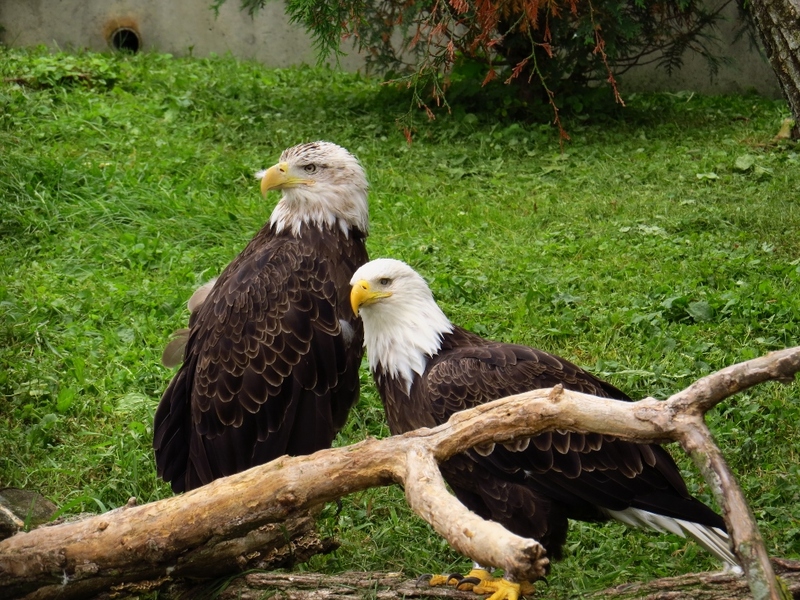 There is an enclosure with two bald eagles that were injured, have been rehabilitated at the zoo, and are unable to be released into the wild. The two are there to welcome visitors to the main part of the zoo. A pair of bald eagles greet visitors. After stopping to admire the flamingos and various ducks near the entrance, Juli and I made our way to Tembo Trail, taking a moment along the way to take a few photos of these lovely lilies. I have been experimenting with my Digital Photo Professional editing software, but that photo was not edited at all! Tembo Trail is really an extension of Africa! because this is where you will find hippos, elephants, rhinos, lions, tigers, etc. 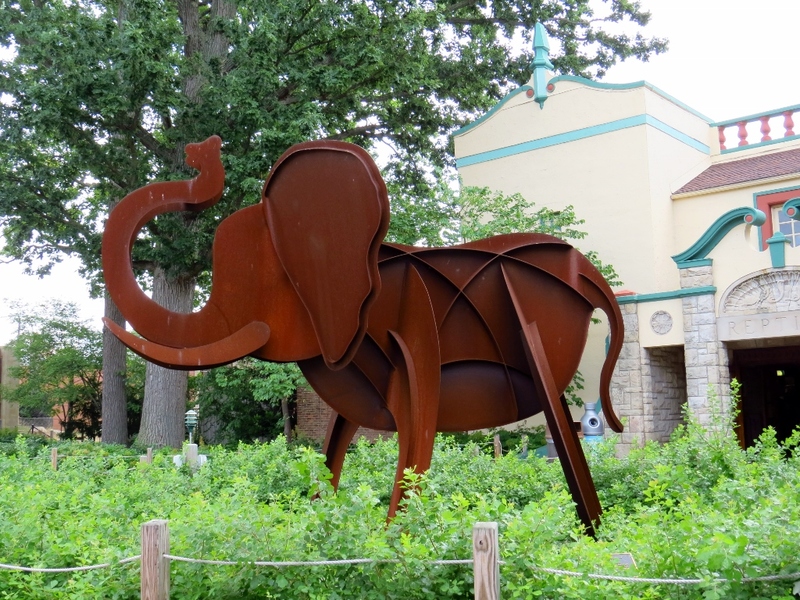 This iron sculpture greets you at the entrance to Tembo Trail. Iron elephant at the entrance to Tembo Trail. Hippos hanging out in the hippoquarium. Hippo eyes are kind of weird! Underwater view of the hippos. I wish I would have been able to get better photos of the elephants, but unfortunately there are these thick cables forcing visitors to stay back! What is up with that? LOL There was not a viewing area with a clear view. Elephant standing on a stump to reach the food. The newest elephant baby – I don’t know its name. African elephants behind annoying cables and wires. A REALLY wild animal at the zoo! Even though I was unable to get clear photos of the elephants, I was able to get decent shots of the rhinoceros (rhinoceroses?). I got a close-up of the one’s horn. Check out how thick that thing is!! Meerkat sentry on the lookout. Meerkat lookout on the rocks. Meerkat keeps a sharp eye out. Turning to look behind him. Perhaps this is what the meerkats were on the lookout for. Although this lioness doesn’t seem to be on the hunt. I love how the orange of the building looks almost like a sunset. After our adventures on Tembo Trail, there was still plenty of the zoo to be enjoyed. My next and final installment will give you a glimpse of some of the groovy reptiles and colorful birds housed at the zoo and I will also share with you our close encounter with the polar bears. 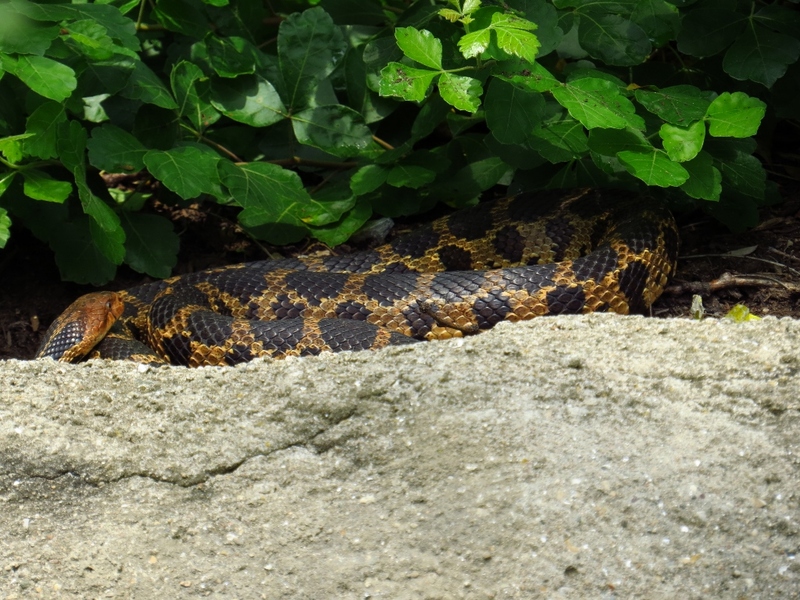 I hope you will join me again next time as we finish our walk on the (kinda) wild side at the Toledo Zoo! Once again I let more days pass between photo challenges than I had originally intended. The reason for this is two-fold. First, the weather changed from cool and rainy to hot and humid, meaning it was hard to be inspired to do anything more than veg in the air conditioning. 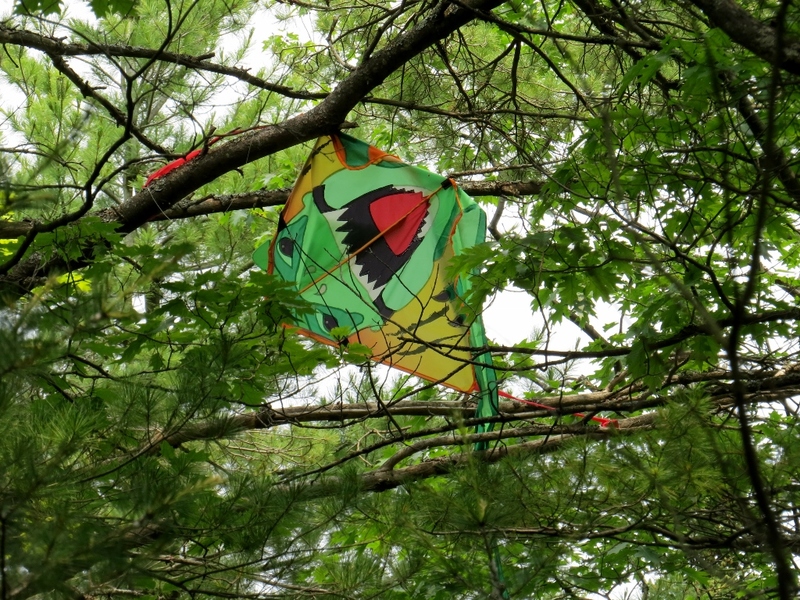 Second, I felt the premise of this challenge – to be inspired by nature – was a bit vague. The instructions for this challenge merely said to take a nature walk and be aware of the things around you such as flowers, birds, animals, etc. There are two sample photos with this chapter, one was more “artsy” and the other was a landscape. So, I let a few days pass trying to discern what it meant to be “inspired by nature”. Even though it is still very warm today, I finally decided I should just take a walk with my camera and see what jumped out at me. I just went out back, down the path I normally walk the dogs. Due to all our rain, large sections of the trail are still under water. We haven’t been able to walk the dogs back there for the past few months. I was smart and wore my knee-high rain boots! Sunlight through Queen Anne’s lace, my favorite of the day. Dragonfly posing on rye grass. Mystery butterfly on mystery flower. 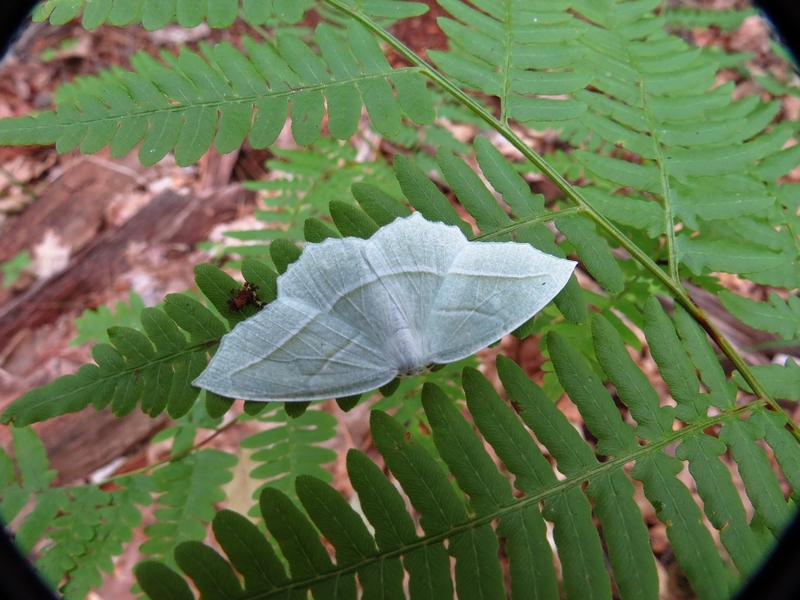 Mystery butterfly with wings partially open. Please be sure to give me your opinions, tips, or tricks in the comment section below. If you would like to join me on the 20-Day Photo Challenge, click the Facebook tab at the bottom of the page and join me on this photographic adventure! For more on Day 1 – Flower Macro – Click here. For more on Day 2 – Scenic Landscape – Click here. Wednesday, July 1, my friend Juli and I went on an excursion to the Toledo Zoo and Aquarium. I came home with 200 photos, many of them pretty good in my estimation, so I have decided to post them in increments so as not to be too overwhelming! Last year I did a short post on the zoo (you can see it here) and in it I mentioned the aquarium that was undergoing renovation. The aquarium had its Grand Opening earlier this year and I have heard wonderful things about it. Even Mark was very interested in the new aquarium, so I decided to purchase a zoo membership so we can go whenever we want to. Unfortunately, on this day, the line to get in to the aquarium was too long, so Juli and I did not get to check it out. We had a “picture perfect” day for our visit. Since we have had so much rain this year and this was the first rain-free day in weeks, the zoo was packed. But we still had a wonderful time. We began on the north size of the zoo, which is much newer, and includes the Arctic Encounter (polar bears), wolves, and Africa! The photos for this post are from the time we spent in Africa! 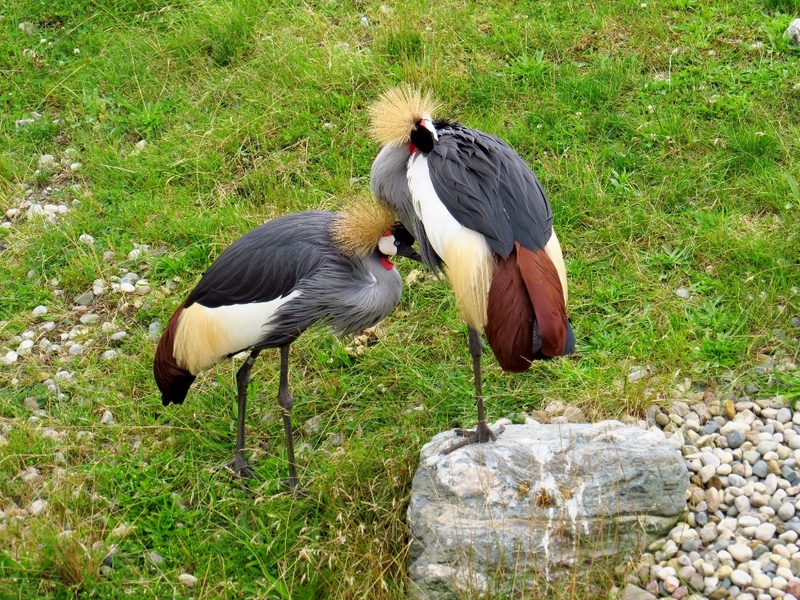 I begin with the African crowned cranes. The newest member of the zoo’s giraffe family. I had fun watching these African white-backed vultures. The one went over and got some hay from the ground and took it back to their log. I don’t know if they were considering making a nest or just what. It was all very interesting to watch! White-backed vulture with beak full of hay. White-backed vulture taking hay to its mate. The kudus and the white-bearded wildebeests decided to put on a sparring exhibition for all the on-lookers. When we went back later in the day, the kudus were playing “king of the mountain” – or king of the cliff, I’m not really sure what you would call it. Kudu and White-beareded wildebeests sparring. My perpetual favorites are the zebras. 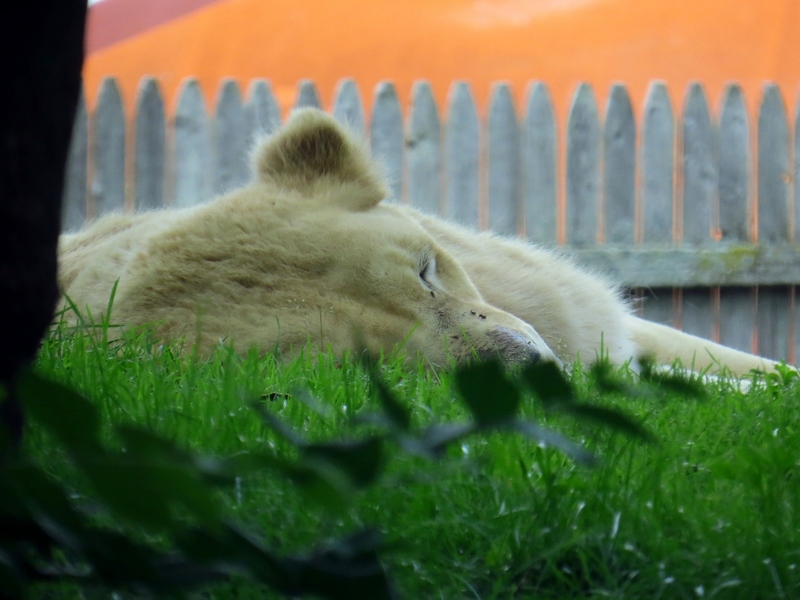 For a long time, the zoo did not have any, and then it seemed like whenever I went, they were indoors, so I was very happy that they were out in plain view this time. I got plenty of photos! Grants zebra – notice this one has a tail, the other doesn’t. Juli and I spent a long time in Africa! We went back again later in the day, before we left. I’ve included two photos in the galleries above from later in the day (one of a giraffe and one of the kudus). Before we left, Juli and I posed with the bronze lions. I’m not sure why these sculptures are in this part of the zoo because the lion exhibit is in the historic south-side part of the zoo. Me with the bronze lion. Juli with the bronze lion. I knew I wouldn’t be able to accomplish 20 challenges in 20 days, but I hadn’t meant to have so many days in between. Several things got in the way of being able to shoot a scenic landscape; I haven’t been feeling well, there were several appointments and obligations on my calendar, the weather has continued to be uncooperative, and most of all I was having a hard time coming up with a scenic landscape to photograph. Today we were finally blessed with a lovely day, I only had one appointment early on in the morning, and I was feeling well enough to take a short excursion for a photo shoot. I finally came up with the “brilliant” idea of driving to nearby Dundee, Michigan to attempt photos of the Raisin River, the dam and the historic mill. Dundee is a wonderful little historic town. It is picturesque and peaceful with great walkability. It boasts some really great restaurants, cute shops, lovely old homes, and to top it off Cabela’s – the outdoor superstore – is just outside of town. Raisin River, mill, and dam, as seen from the river walk. Raisin River, mill, and dam – Dundee, MI. Raisin River, mill, and dam as seen from the pagoda in the park. I am not sure I’m completely satisfied with the results, I think I have a little ways to go in truly understanding landscape photography and developing an artistic eye. But these aren’t horrible considering I don’t live in an area rife with scenic landscapes to shoot. I think my favorite is the last shot, although I might have gotten too much of the tree in the foreground, I like the effect of the railing. After I left Dundee, I attempted to drive the back roads coming home, hoping to spot a scenic barn or silo, but unfortunately it seems in this day-and-age you can no longer meander along country roads at a slow pace. It seemed like every road I chose to travel I ended up with someone on my bumper, even when I was doing well over the posted speed limit. Please share your comments and tips for getting good landscape shots in the comment section below. And if you would like to participate in the 20-Day Photo Challenge, please join me on Facebook via the link at the bottom of the page. Come along and join the fun!! If you are new to my blog, you can see the results of the first photo challenge – Flower Macro – here. Happy Shooting! 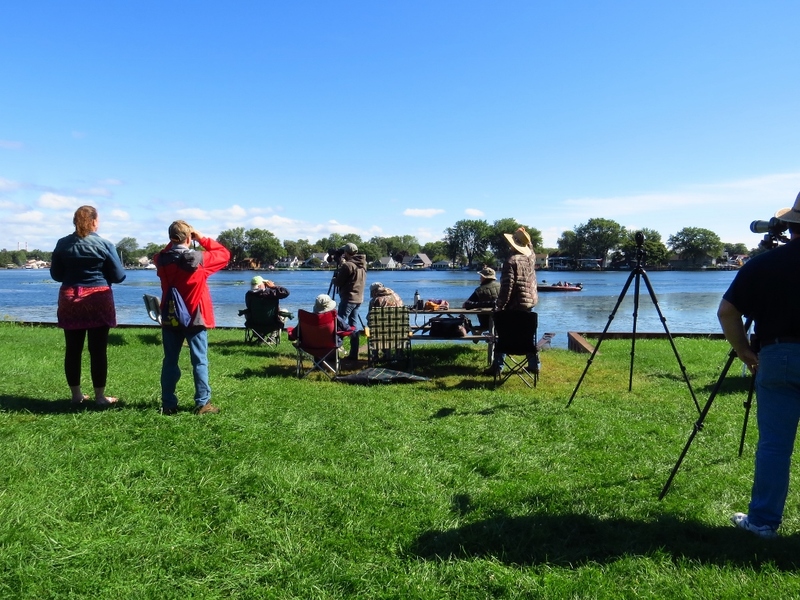 I mentioned in a couple of my Northwoods Journal entries that I have been reading a helpful book titled “Better Photo Basics: The Absolute Beginner’s Guide to Taking Photos Like the Pros” by Jim Miotke. I have really been enjoying this book and will write a full review of it soon. Whether or not I will be able to “take photos like the pros” when I am done is anyone’s guess, although I am guessing no at this point. It is my hope to complete each photo assignment. I doubt I will be able to do 20 assignments in 20 days, but I hope to post each time I have done one of the challenges and show my results. 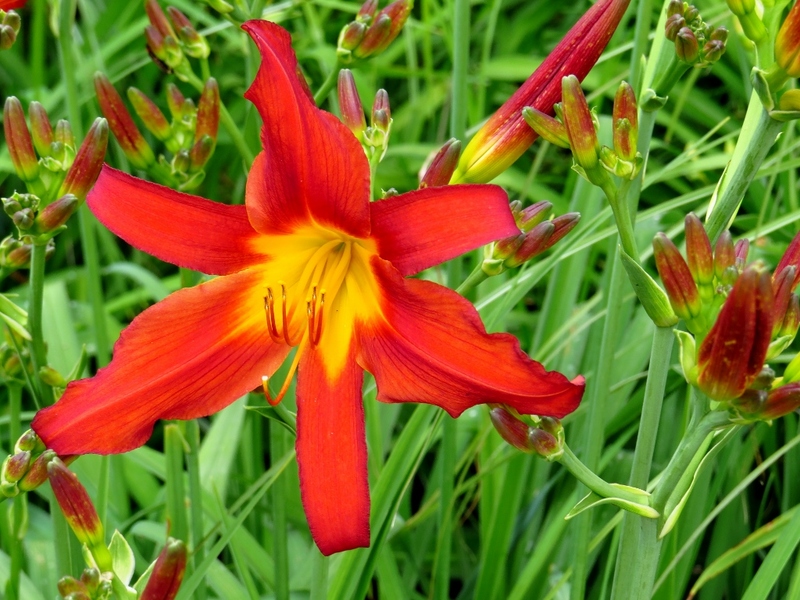 The first assignment is to photograph a flower close-up. I went out this evening at the “golden hour” hoping for good light, but most of our new landscaping/bird sanctuary is in the front (east side) of the house and therefore shaded in the evenings. But still, I came away with six acceptable images. Even though the instructions said to turn the flash off, I experimented using the flash a few times, just for kicks, and one of those images is included in the gallery because I rather liked that way it turned out. Coneflower in full bloom, with flash. Sunflower – my sharpest image. Sunflower – my favorite of the 6. Click on any photo in the gallery to see a larger version. It was already warm and humid when we got up in the morning. The forecast was calling for a hot day and they would be right. We ate a simple breakfast out on the porch and watched the birds. There was a female and male rose-breasted grosbeak this morning. I didn’t dawdle watching the birds too long because I had to wash up and dress so we could take the dogs for a short hike. We went out through our woods to the clear-cut area then up Stevens Spring to the ATV trail and followed it back to the marshy end of Sportsmen Dam Lake. Even mid-morning it was already too hot to go very far. We saw an indigo bunting and a great crested flycatcher but I didn’t attempt to get any photos. We had agreed to do something “touristy” today but couldn’t seem to agree on just what that should be. Since it was going to be a hot day, a drive sounded like a nice idea so we settled on taking a tour up the Sunrise Coast of the state, north of Alpena and hoping to get to Mackinaw City. I packed us a nice picnic lunch and we set off. Mark took the “back way” to Alpena down Long Rapids Road and it was a really nice drive with plenty to see along the way. Much prettier than taking M32 across. Our plan was to stop first at the Alpena Wildlife Sanctuary and this time we DID find the entrance, only to find that the park is under construction and there was no access to the Island Park. This was disappointing, but now that we know how to get in, we will make a visit another time. We continued north on US23, stopping at a roadside park next to Grand Lake for our picnic lunch. Unfortunately there were no picnic tables in the shade and the sky was still hazy with a very harsh light. It wasn’t soft light like on a cloudy day, but a hard light that hurt the eyes. I decided to try the polarizing filter on my camera to see if that would help defuse the light, but I’m not at all sure I liked the results. Here is the view from our picnic spot. On the shore of Grand Lake north of Alpena. I thought this sailboat looked inviting, but it really was out of range of my camera and the bright light didn’t help matters. 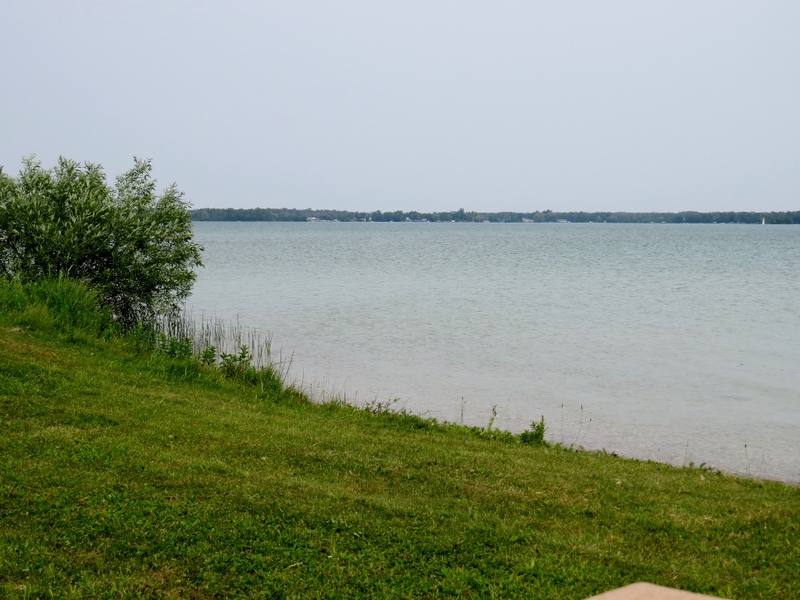 After our lunch, we continued up the coast and wouldn’t you know, not too much farther north we found a nicer picnic area right on the shore of Lake Huron! We got out and walked down to the beach to take in the view. I was wishing I had brought my flip-flops so I could stick my toes in the water. You can see from this photo that the hazy sky just about blends in with the surface of the lake! 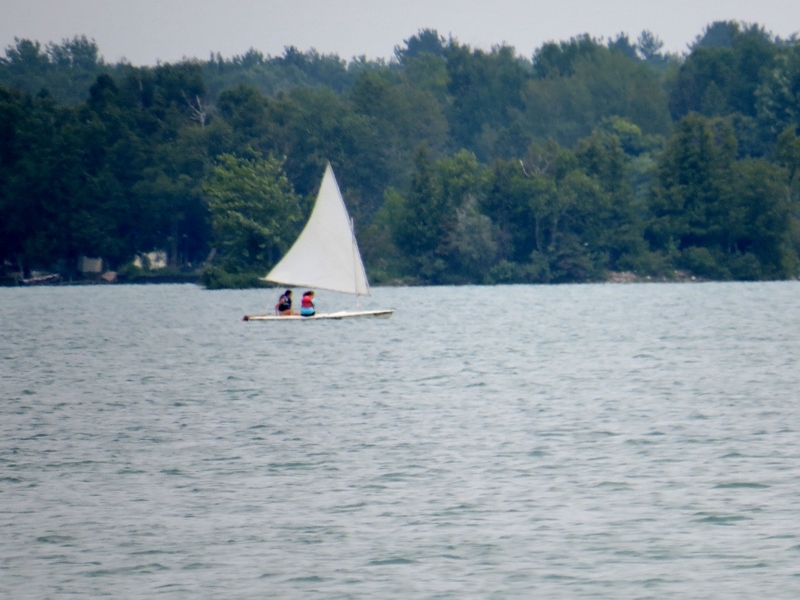 A hazy view of Lake Huron. There were two birds in the pine trees next to the parking lot and for a few minutes we thought they might be Kirtland’s warblers, which caused us some momentary excitement. I tried to get a couple of photos shooting from underneath, but none of the shots turned out and after consulting the field guides, Mark decided they weren’t Kirtland’s after all, so nothing to get excited about after all. They were probably yellow-rumped warblers. We hadn’t gone too much farther when we saw a sign for Hoeft State Park. We had never been to this park before so decided to check it out. It turned out to be more of a camping state park, kind of like Clear Lake near our cabin. But they have a day use area so we decided to see what there was to see. We had barely stepped onto the trail that leads to the beach when we saw a tiny ball of fluff on the ground – a baby bird right on the trail! Baby bird calling for momma. Of course I immediately dropped down to start taking photos and it wasn’t but a moment when the mother (?) arrived to feed the fledgling. 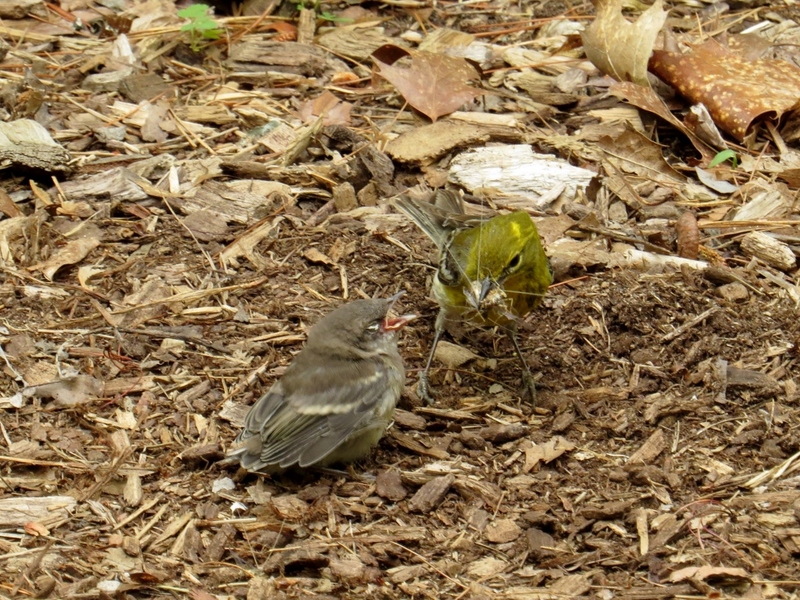 Whether the baby fell out of the nest, or just failed at fledging, I have no idea. I must have taken at least 50 photos, creeping closer every few minutes. I spent at least a half-hour on the ground watching these two, and warning passers-by to not step on the poor, helpless baby. Mark went back to the car for the field guide and after much discussion and referring back to my photos, we decided this is a yellow-throated vireo! 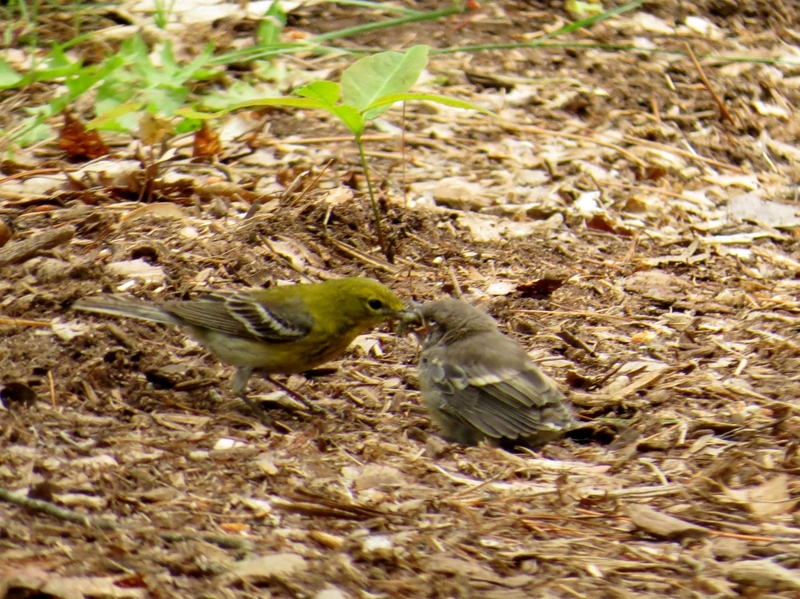 Yellow-throated vireo with bug to feed baby vireo. 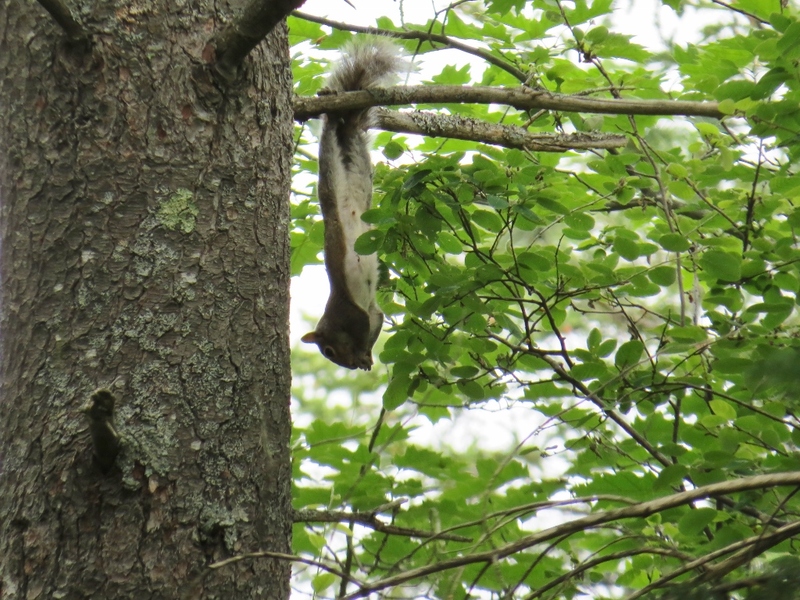 While watching the birds, something high in the trees caught my eye and I glanced up to see this red squirrel dangling by its toes from a branch. What a hilarious sight! The park has a very nice shelter house with picnic tables, a fire place, bathrooms, etc., down near the beach. We stopped there to inspect the photos I took and consult the field guide some more, trying to make sure of our I.D. People were coming up from the beach complaining that the biting flies were vicious, so I was glad I was wearing jeans! This is the view down to the beach. 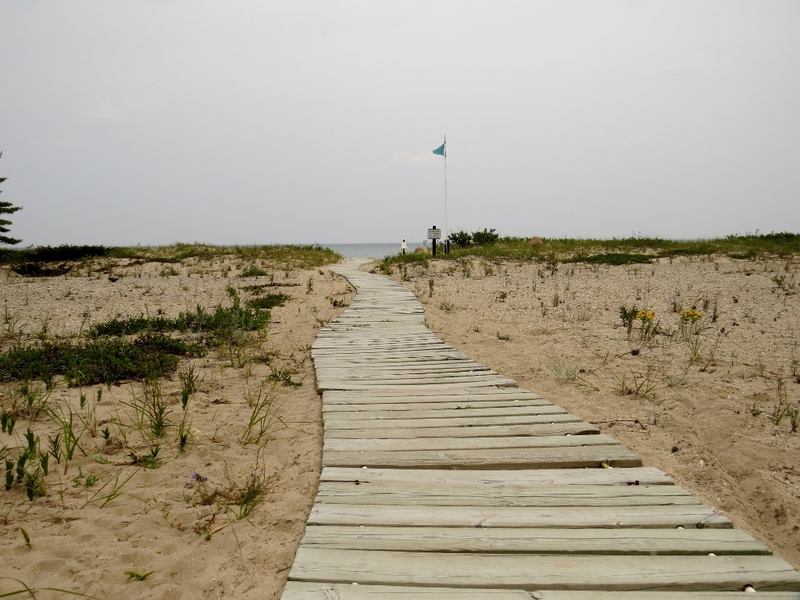 Boardwalk down to the beach, Hoeft State Park. 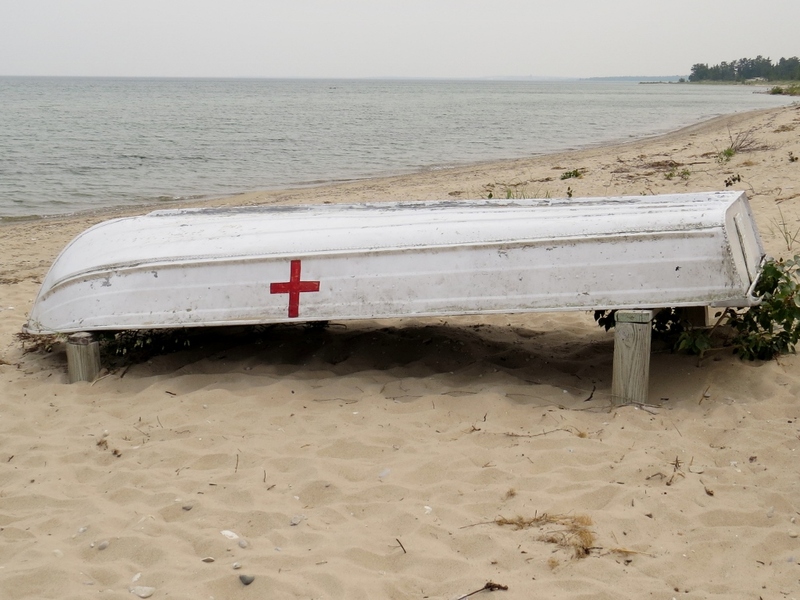 Here is the life boat. It probably would have made a better composition if the light wasn’t so washed out. 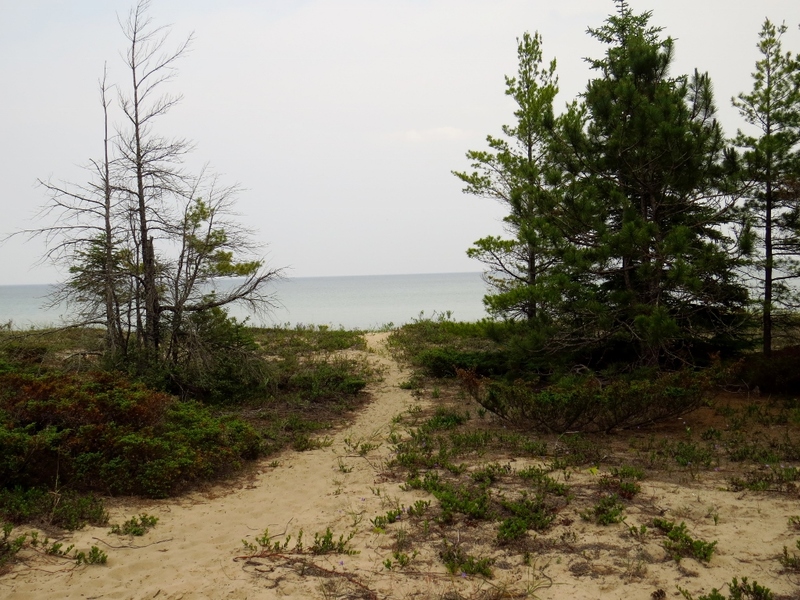 We walked one of the hiking trails just a short way, to another access point to the water. 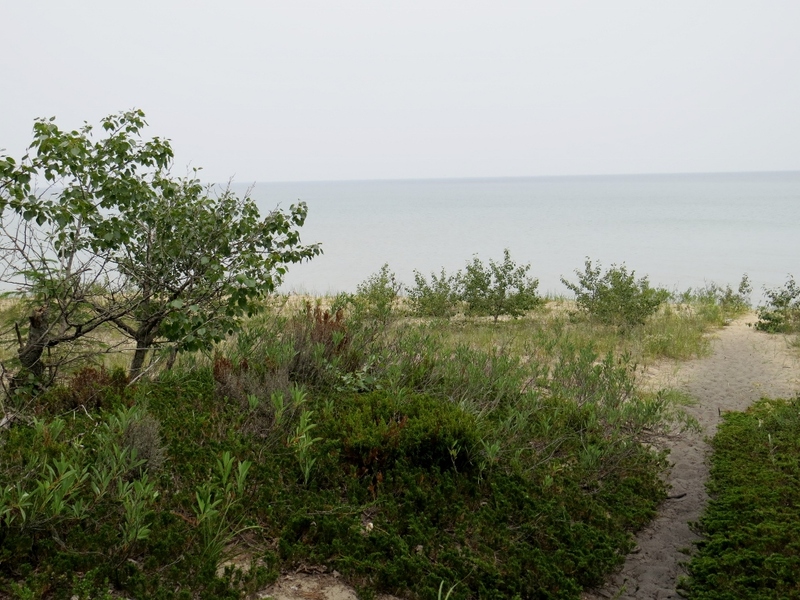 Lake Huron as seen from Hoeft State Park. It was way too hot to walk far and the flies WERE biting, even through our T-shirts! 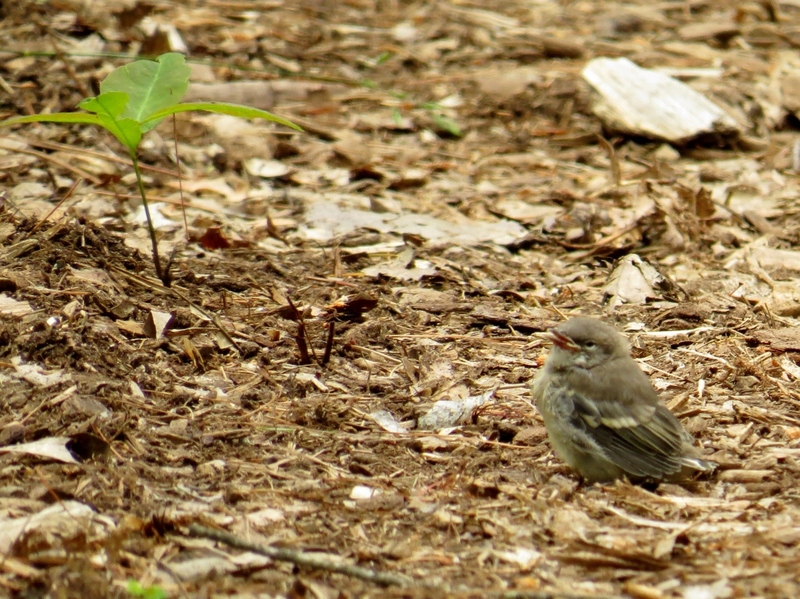 Baby vireo and parent were still there when we walked back to the parking lot. On our way out we stopped at the check-in station at the entrance to see if anyone there was well versed in birds and of course it was just two teenaged girls who didn’t really know a thing. 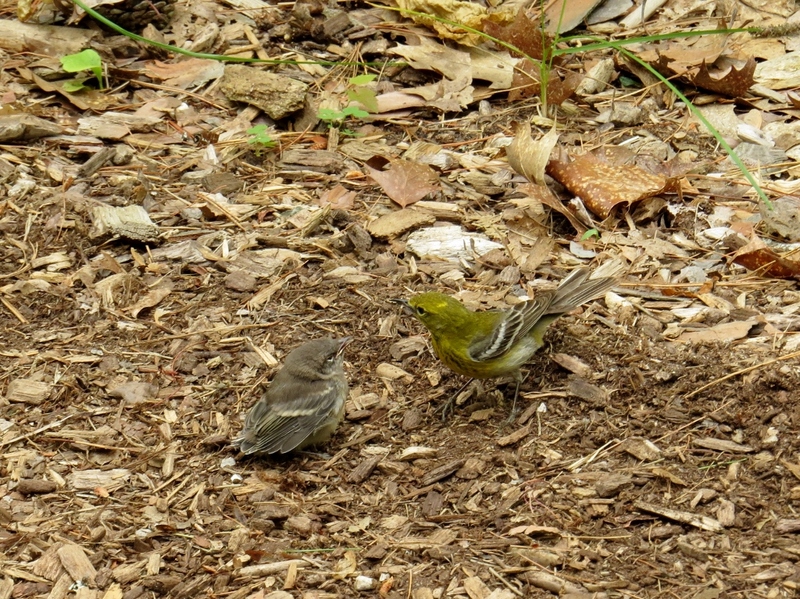 We told them of the baby vireo on the ground and said perhaps someone should check later to see if it was still there. I can only hope it had a good fate. By this time the afternoon was quickly disappearing and we still had the dogs back “home” to worry about, so it was obvious we weren’t going to make it to Mackinaw City. We never even made it to Cheboygan! 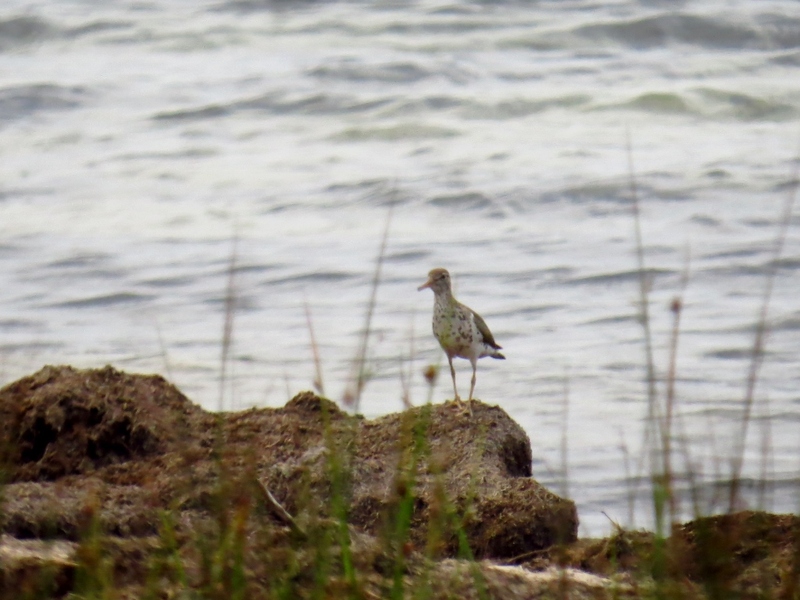 Mark did drive a bit farther up the road and we stopped at a boat launch area where I got to add another bird to my 2015 Big Bird List – a spotted sandpiper! Finally, a shore bird! 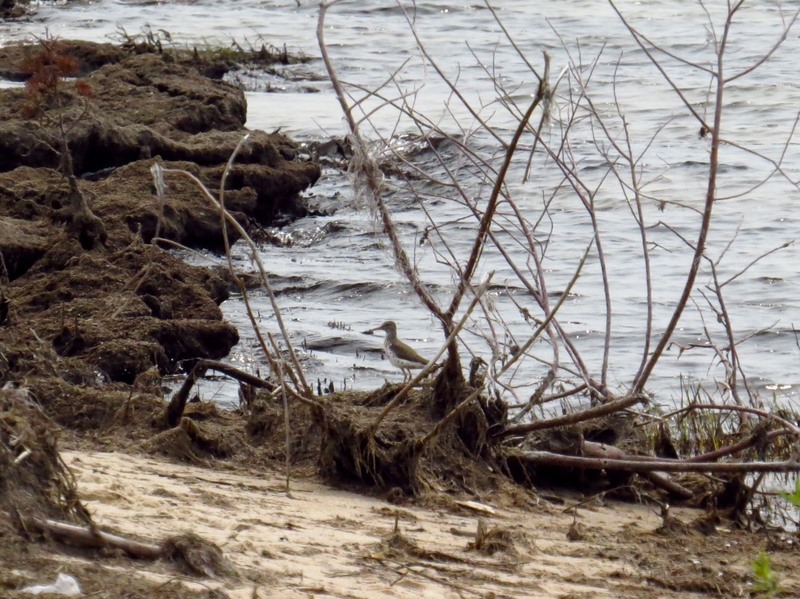 Spotted sandpiper on the shore of Lake Huron. Again, not the most stellar photos, but I will take what I can get at this point! There was also this huge flock of common mergansers. This photo is awful because they really were too far away, but I’m posting it only to show how huge the flock of ducklings were. When we really blew it up on my computer screen, Mark and I counted at least 24 ducklings! We think there might be 3 adult mergansers in there, too, but we can’t be sure. 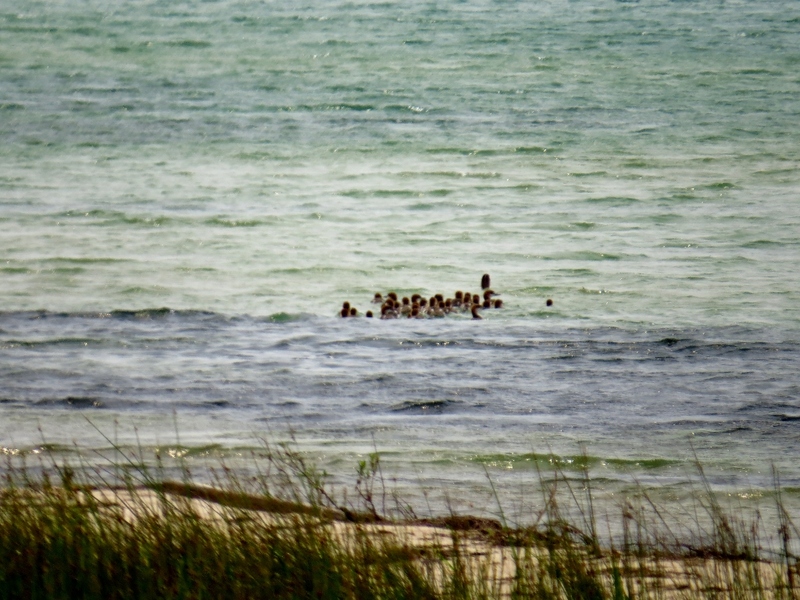 I tried to walk closer, but the farther I walked up the beach, the faster they continued to swim away from me. Huge flock of common mergansers. Before we left, I made another attempt at flying bird photos. Does this look like I’m improving any? It was so sticky-humid when we headed to bed, I was hoping for a rain shower during the night to break things up. I went to bed feeling quite pleased with our day, especially our surprise encounter with the baby vireo. No place to go today, so we had a very nice, relaxing day. 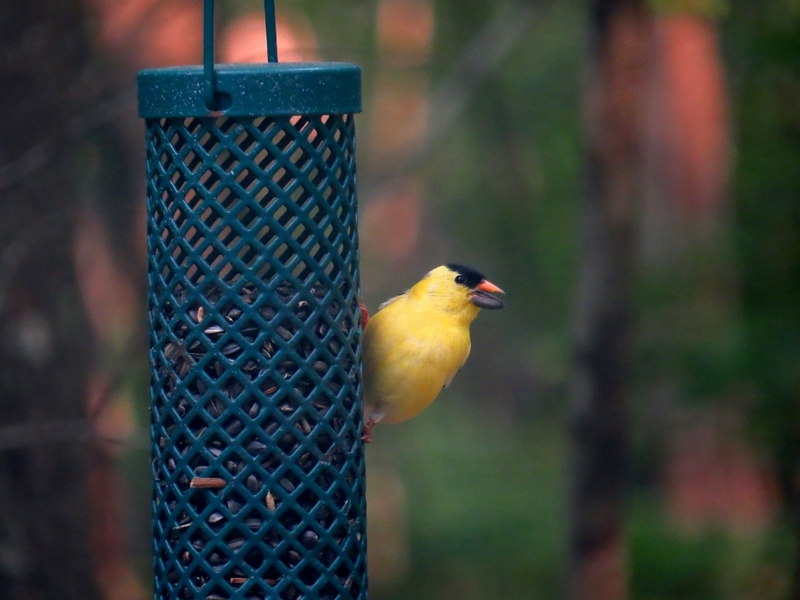 And, the birds began showing up at the bird feeders today! So, I have several photos to share. Mark fired up his Coleman stove and fried bacon for breakfast while I made French toast with some thick Texas toast bread. I even made some homemade blueberry “syrup” with fresh blueberries from our bushes back home. (The wild blueberries look terrible this summer, so no picking up here.) We ate out on the porch and enjoyed the birds. 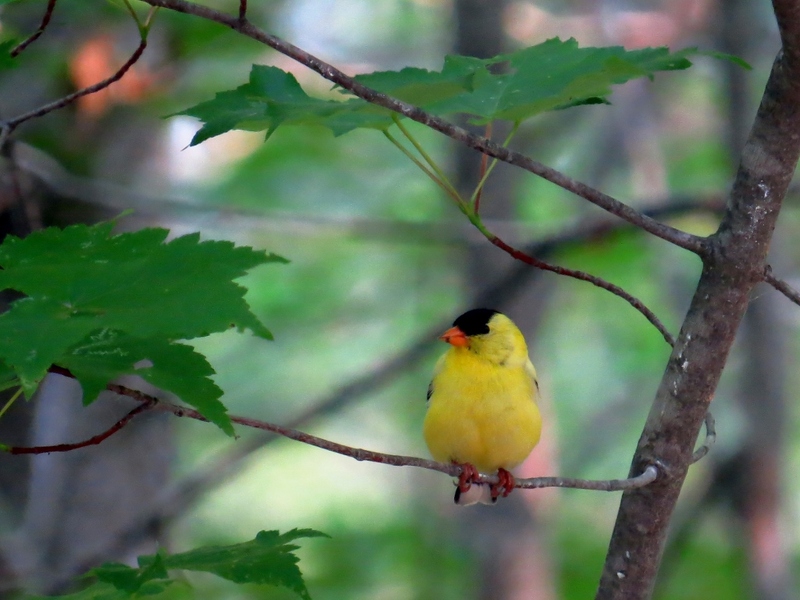 There were goldfinches this morning. 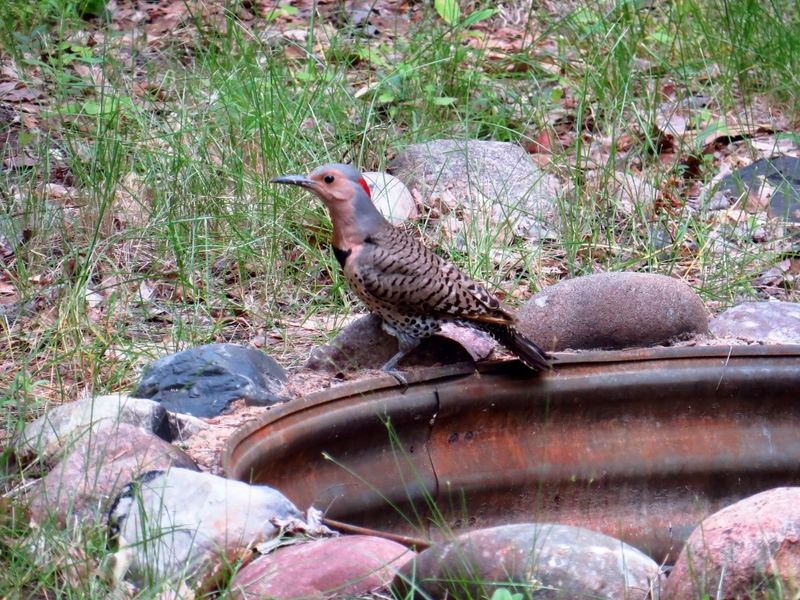 And this northern flicker found some ants in the fire pit. He first landed on the right side of the fire ring – unfortunately my photo of that was blurry – then he jumped down in the fire pit. I managed to get a shot of him peeking out from the pit. 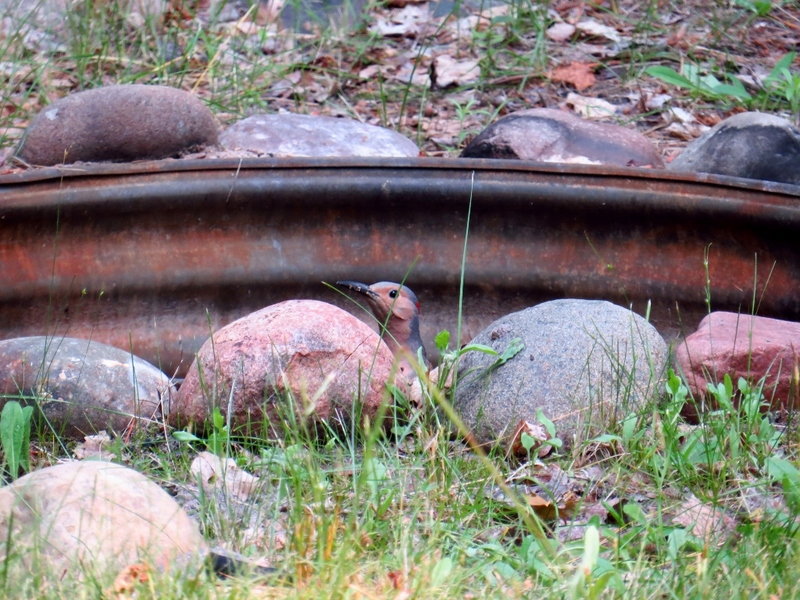 Northern flicker in the fire pit. Then he hopped back up on the other side. Northern flicker looked for ants. Eventually we got around to go for a nice hike. Mark wanted to go back to the area we hiked yesterday because we had seen where the High Country Pathway crossed the trail we were on, so he wanted to go back and hike some of that. 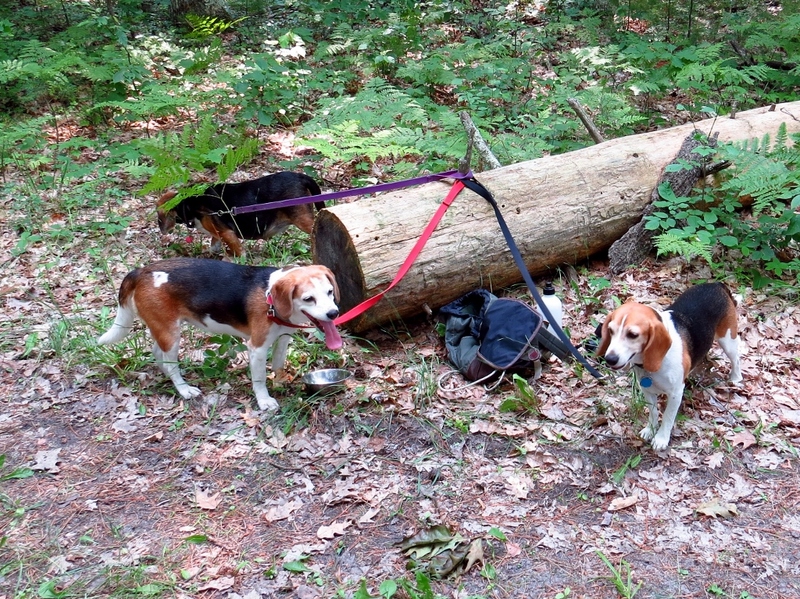 We parked near the fallen log where we rested the dogs yesterday. Hiking the Pathway is a little bit of a challenge with three dogs. It’s much easier to walk them on ATV trails that are wide. The High Country Pathway is a pretty narrow trail in most places we’ve hiked. I was keeping my eyes open for interesting landscape or macro things to photograph, but Mark wasn’t much in the mood for stopping for me to play photographer. He will tell you that he’s very supportive of my hobby, but at times his support has limits and they can be fairly short. I did manage to try a macro of this moth on a fern. The moth was much whiter that it appears in this photo. It was quite hot and humid so we didn’t take the Pathway too far. 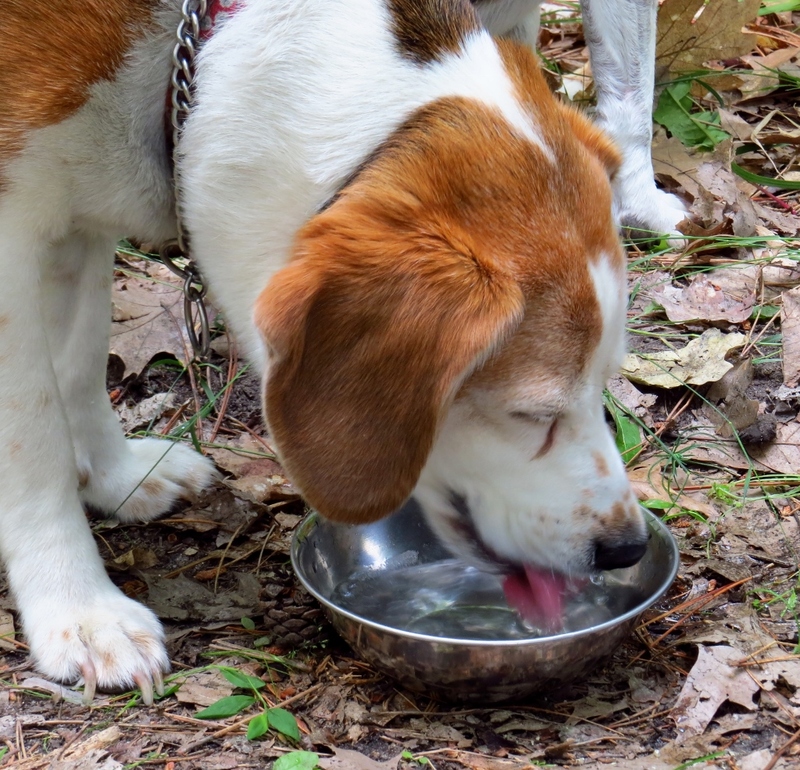 When we got back to the fallen log, we stopped to water the dogs who had worked up quite a thirst in the heat. We decided to explore a bit more of the trails in this area and so drove a short way and found another interesting place to hike. 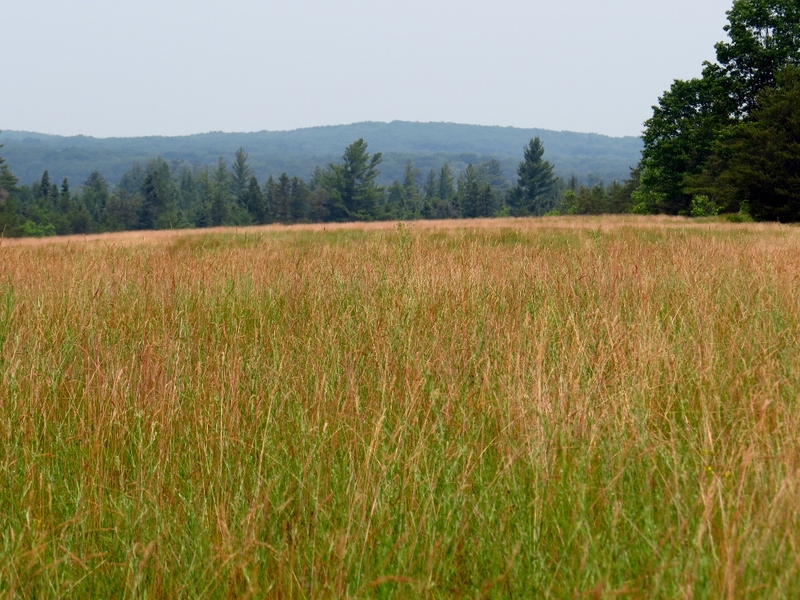 The trail took us into this huge rye field where there were some pretty views. Huge rye field with pretty view. The dogs were forced to take another rest in the heat. Beagles taking a rest in the shade. Later Mark would look up this area on the satellite map and there are plenty more trails to hike through here, so we will definitely be coming back again. It was a really pretty and quiet area. Back at the cabin, we ate our lunch on the porch and enjoyed the quiet. I love the day after a big holiday weekend, when everyone else goes home and the peace returns to the north woods! I spent some time reading more of my Better Photo Basics book, playing with my camera, and taking photos of the birds. The downy woodpecker made an appearance. 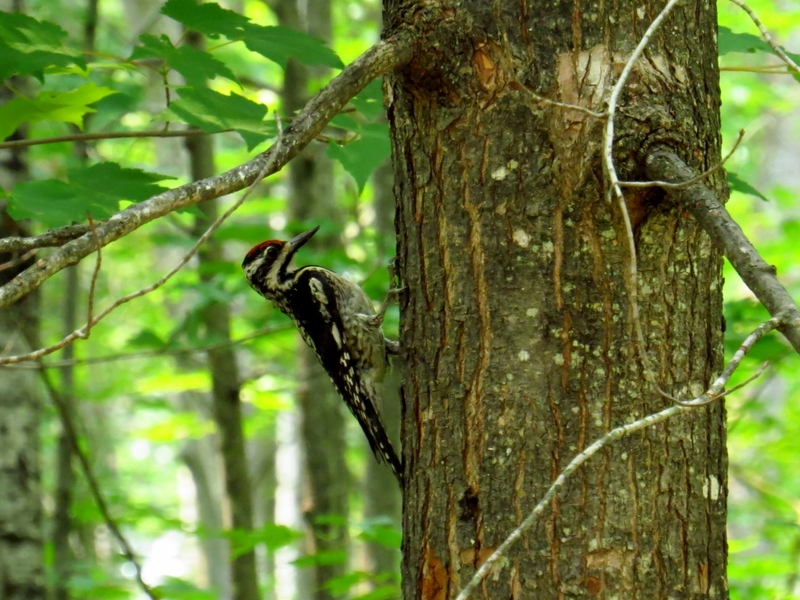 And the yellow-bellied sapsucker. 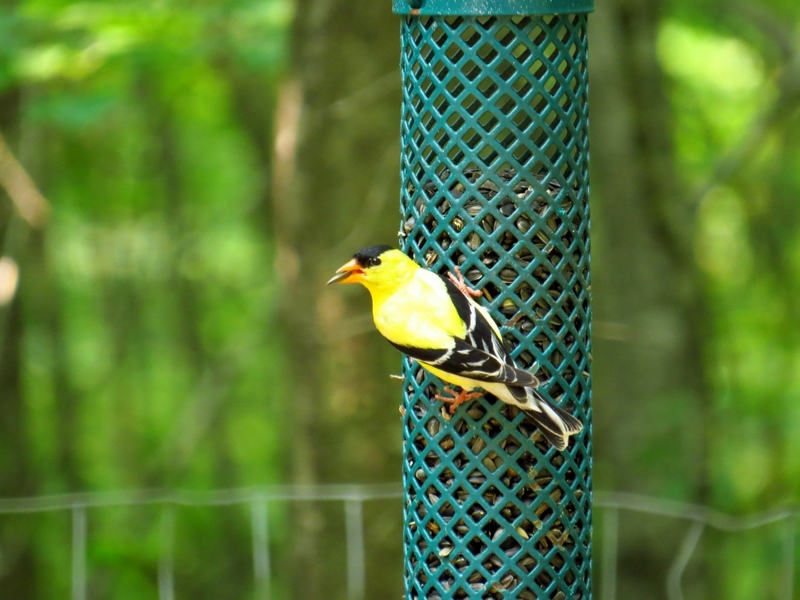 We’ve been seeing quite a few yellow-bellies this time, but not at the feeders. 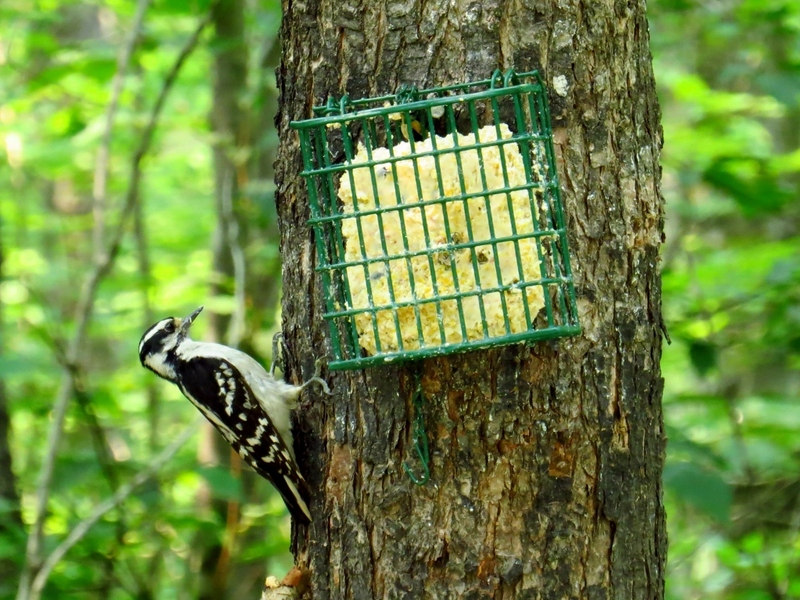 Yellow-bellied sapsucker, the rock star of the bird world. Then I noticed two small brown birds in the trees. It turned out they were two female rose-breasted grosbeaks. They were fairly small and stayed together, so I think they were sisters from the same nest that had recently fledged. They were very timid. 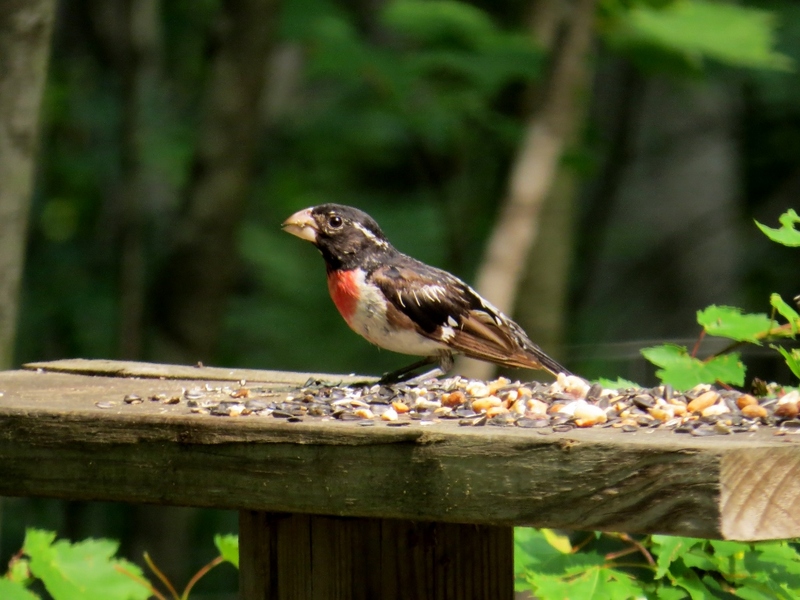 Young rose-breasted grosbeak approaches the feeders. Young rose-breasted grosbeak (f) at the feeder. Later in the afternoon we went for another hike. I asked Mark if we could go over to Lookout Ridge and hike the western ridge where there is a really pretty view. 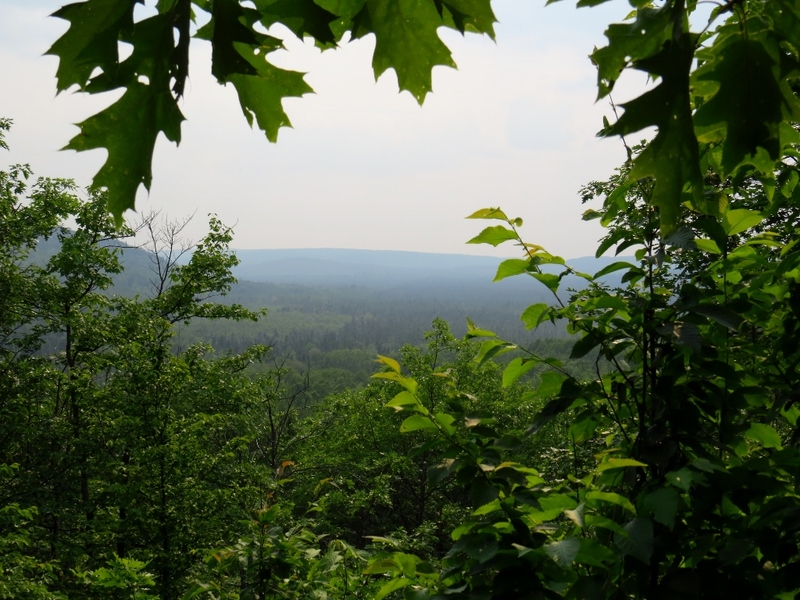 It’s a bit of an uphill climb to start but once you get to the top of the ridge it’s a really nice hike and the view on the western edge just can’t be beat. You could almost believe you are in the mountains! You can see a bit of a haze in this photo and the landscape photo from our earlier hike. 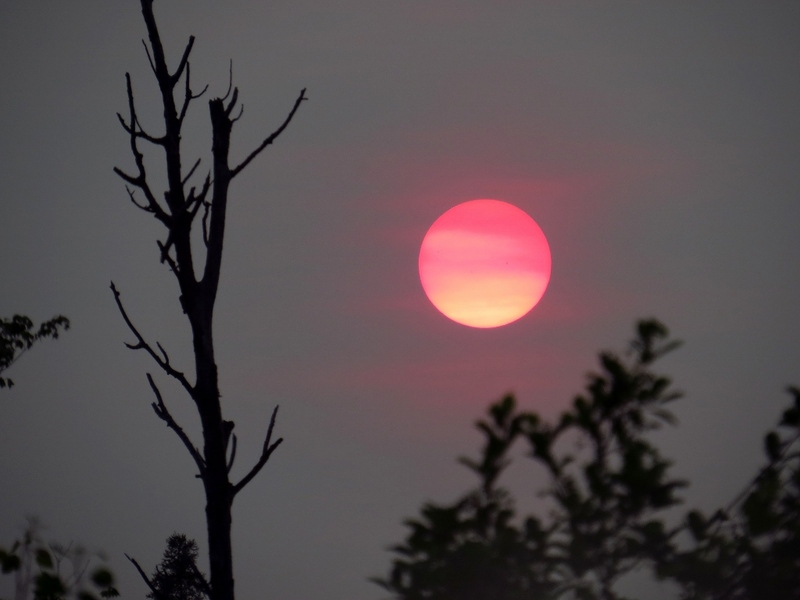 Later we would learn that the heavy haze was caused by forest fires in Canada. It would be even worse the next day. It only takes about a half-hour to climb the hill, walk across the ridge and come down the other side and then back around to the field where we parked. Considering it was still very hot, a half-hour was just enough. Making our way back to where we parked. Mark made a fire and made some BBQ chops on his tri-pod grill. We ate outside on the porch for all three meals!! It’s kind of funny because we have a nice patio at home and rarely eat outside in the summer, but when we are here we rarely eat inside! We were both very sweaty from the heat so washed up early and had a quiet evening. Friends of ours surprised us by driving up the driveway in their Mule. We had a nice visit, which was the perfect ending to our restful day! P.S. I don’t know what is going on with WordPress, but I am having problems with formatting my posts. I get them all set up and then when I look at the preview there are big gaps and spaces between photos that I did not put there, and the fonts are changed in the captions. So, I apologize if anything looks bad! No lollygagging around this morning. Mark had seen in the newspaper that there were garage sales north of us going toward Hillman and Long Lake so we ate a quick breakfast and got out the door. Lunch was eaten out on the porch. Still no birds at the feeders, except for the hummingbirds, which refuse to let me take their picture! After lunch we made a bowl of Mark’s favorite macaroni salad (his mom’s recipe that I’ve been making for 30+ years now) to go with our dinner later and then it was time to take the dogs on their hike. Mark drove quite a ways over to the area of Rouse and Roth Roads. There are some good trails in this area and we haven’t hiked there in awhile. Unfortunately we didn’t see anything worth taking a photo of, but I did get a picture of the beagles when we stopped to give them a rest. This log was very convenient for looping their leashes over. The beagles aren’t that fond of resting. The County Sheriff and the veterans start things out. Jeep of veterans, always one of my favorites. Every parade needs a classic car. Floats for the Montmorency County 4-H fair and also for the Eagles. The Tri-Township Fire Department brought up the rear. Every fire department must have a Dalmatian! The parade lasted less than a half-hour and by 6:30 we were heading home for Mark to grill our steaks and to enjoy our dinner out on the porch. 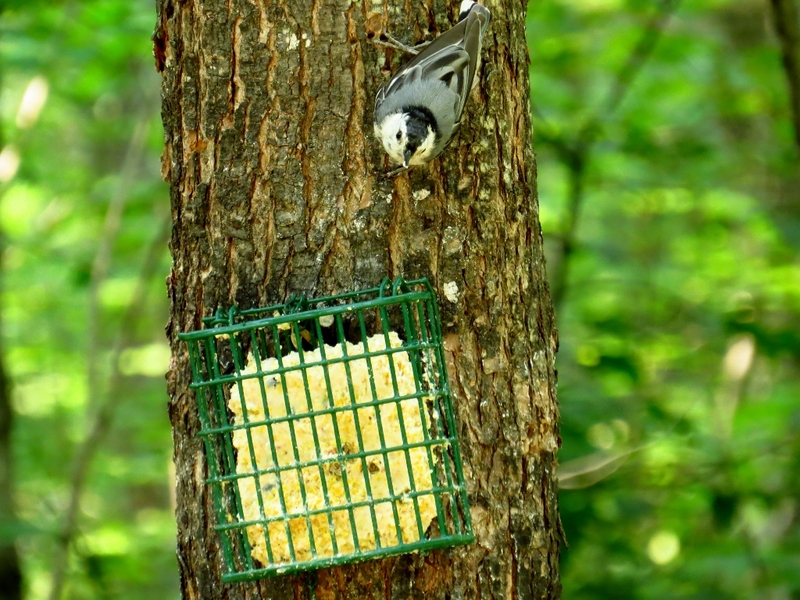 The hummingbirds kept us entertained and a couple of hairy woodpeckers finally found the suet. Incredible 4th of July sunset. For a small town, Atlanta puts on a really good fireworks display. People turn out in droves for the show and the field is always packed with cars. People have fun playing catch or lighting sparklers. It’s fun just to people watch! 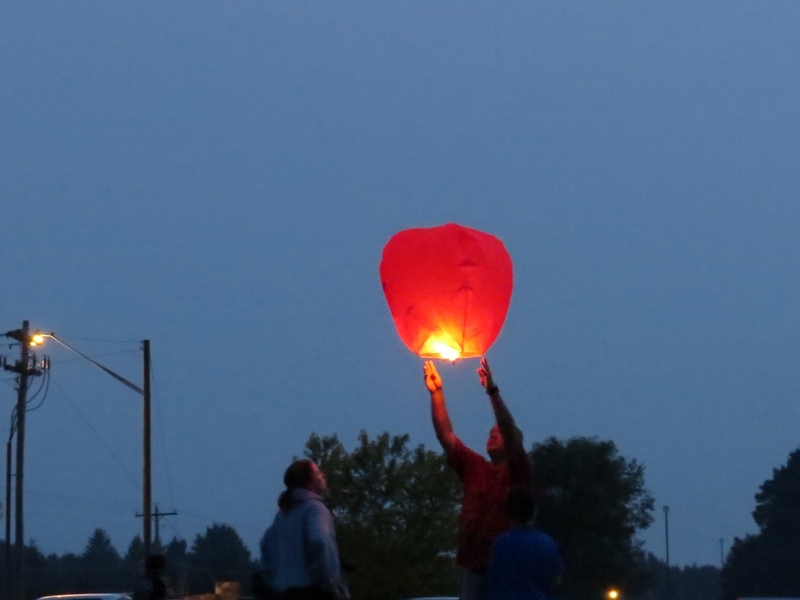 Another popular activity is launching Chinese lanterns. Here is a photo of a group of people preparing a lantern. Group preparing a Chinese lantern. And here it is floating high in the sky. 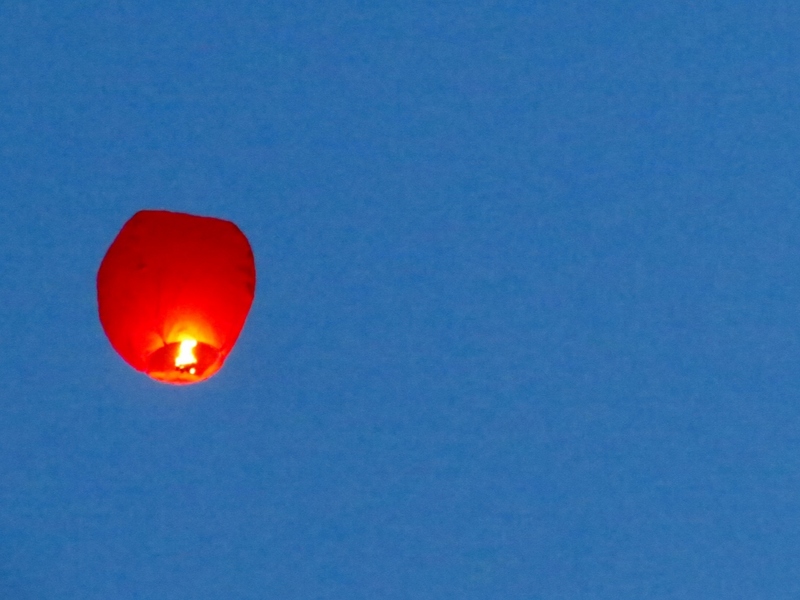 Chinese lantern floating into the sky. 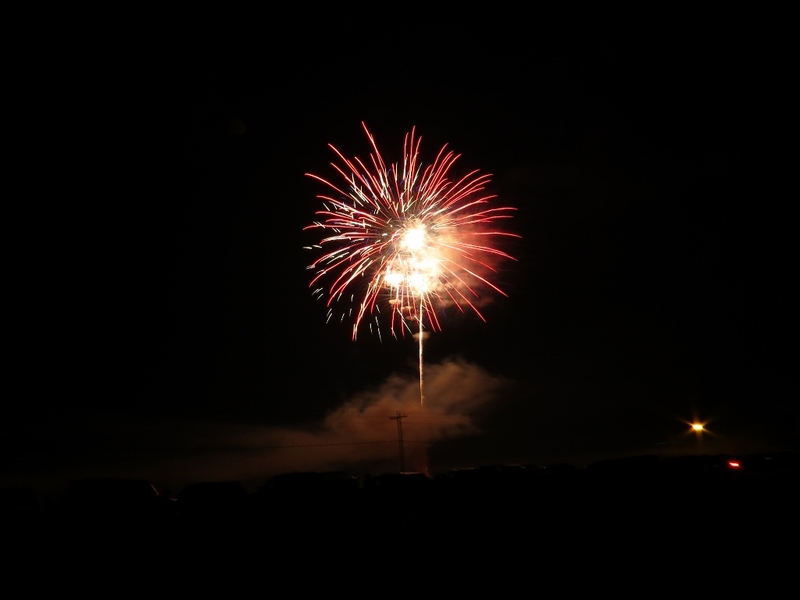 I don’t have a tripod (yet) so getting good fireworks photos is impossible. Here is the best of my attempts, of the grand finale. I liked the ghostly look of the “cross” (telephone pole) at the bottom. Since fireworks only come around once a year, it’s a little hard to practice! The barred owl was calling when we got home. It was the perfect grand finale to our All American day! I pray you and yours had a fun and safe 4th of July!